The Honey Tongues describe themselves as ‘Swamp Opera’, combining Americana roots, and indie swing with soulful harmonies and beat-boxing. Crafting delicate folk arrangements and stomping dance numbers, the band embraces a wide palette – from accordion to saxophone to mandolin to mouth percussion. 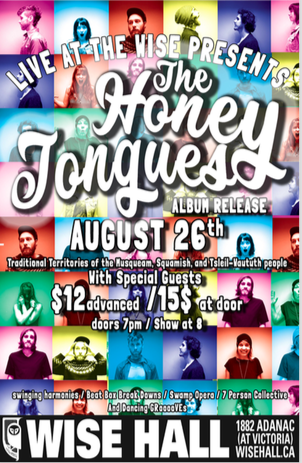 They’re releasing their first full length album @ the Wise Hall August 26th. They’ve been wowing audiences from Campbell Bay Music Festival, to Saskatchewan to MOM in Fort St. James. This is a show you don’t want to miss!